Khyber Pakhtunkhwa Board of Technical Education Peshawar entered in agreement with A2Z E-Payments for providing the result of examination to the students of BTE through an sms and eDMC ( subject vise detail). Now Students of BTE can easily check their result every where by sending a single sms to 9818. They will receive their result in a message. eDMC is another service by A2Z e-Payments for the students of BTE. 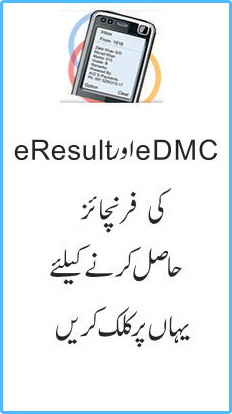 Students can get their eDMC (subject vise detail) from all the franchises of A2Z E-Payments through out the Khyber Pakhtunkhwa.